You remember this theme from Steven Spielberg's heartwarming classic released more than 20 years ago. But let us begin the story some years earlier. Together with dozens other products like compact powerful electronic calculators for home and office, multi-function digital timepieces with long life batteries for men and women Texas Instruments introduced the talking learning aid called Speak & Spell™. This red and yellow plastic, notebook-size learning aid is an outgrowth of TI's basic research in synthetic speech. The product is designed to help children seven and up learn how to spell and pronounce more than 200 commonly misspelled words. Solid State Speech™ is an entirely new concept which stores words in a solid-state memory much like a calculator stores numbers. Unlike tape recorders and pull-string phonograph records used in recent years in many "speaking" toys, TI' Solid State Speech circuitry has no moving parts. When it is told to say something, it draws a word from memory, processes it through an integrated circuit model of a human vocal tract and then speaks electronically. In its main mode of operation, Speak & Spell randomly selects a word and pronounces it in standard American English. A child presses the unit's alphabetic keys to spell the word, which appears, letter by letter, on an eight-character display screen. Right answers earn verbal and visual praise; wrong answers receive patient encouragement to try again. A number of games are offered to intrigue children of all ages. From the beginning, demand was high, even at the - then - high retail price of about $50. The Speak & Spell changed ist clothes. Instead the raised buttons of the predecessor the new one got a flat mebrane-type keyboard. All other changes between the models are negligible, they reflect mainly the usual process of cost optimization. More important was the introduction of two sibblings, the yellow Speak & Read and the grey Speak & Math. All three educational toys used identical electronics with some changes in the software and different solid State Speech™. Steven Spielberg began filming of „E.T. - The Extra-Terrestrial“. The movie „E.T. 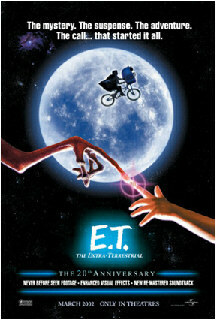 - The Extra-Terrestrial“ was shown the first time on the important Cannes Fim Festival in France. A 10 year old boy named Elliott (Henry Thomas) finds a friendly alien from another planet in the family's back yard shed and hides him in his bedroom. He can't keep his secret for long and soon his sister Gertie (Drew Barrymore) and brother Michael (Robert MacNaughton) are in on the plan to help the alien return to his home planet. In the short time that Elliot and E.T. spend together they live the adventure of a lifetime. Elliot teaches E.T. about the joys and sorrows of living on Earth. 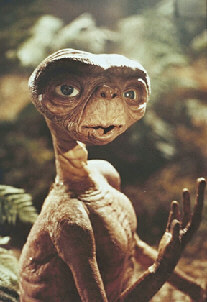 In return, E.T. teaches Elliot about the true meaning of friendship and love. The two friends become inseparable. The theatrical release took place in hundreds of cinemas all over the Unitet States of America. 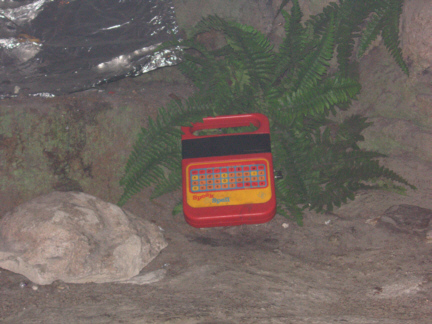 The Speak & Spell became famous as the toy that E.T. 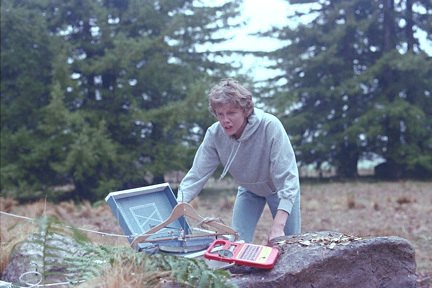 rigged up to "phone home" in Steven Spielberg's summer blockbuster, „E.T. the Extra-Terrestrial“. Marketing people from Texas Instruments responed quickly on the huge success of the movie. Within weeks both a E.T. version of the Speak & Spell and a calculator appeared. The Speak & Spell got a new box with the E.T. pictured and a Solid State Speech™ module featuring E.T., the alien from another planet. The red coloured E.T.™ calculator was delivered toegther with a small figure of the famous E.T. creature. From the technical view it was just another design of the original TI-1030 calculator introduced earlier. Later even for the Touch & Tell educational toy a E.T. cartridge was released. Theatrical re-release of the 20th anniversary edition. Recently Mark Cook, a friend of the Datamath Calculator Museum, travelled from United Kingdom to Florida and visited the Universal Studios. Waiting in the line to board the "E.T. Adventure" ride he walked through a forest created to look like the one in the movie and in the middle he spotted the famous communicator device! This replica is complete with a working Speak & Spell which scrolls a message across its display. You may notice that E.T. 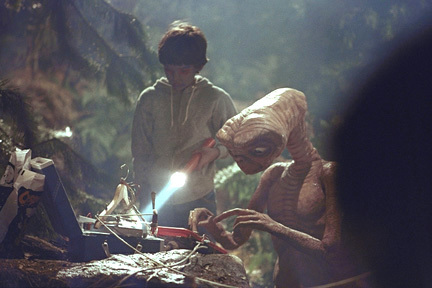 obviously used a Speak & Spell (Version 2) to create his wonderful communication device to "phone home". If you are interested in the mysterious communicator E.T. assembled from everyday items found in Elliot's house to sent a signal to reach his extraterrestrial family you should visit the Chicago Museum of Science and Industry or just open a Speak & Spell. If you think about your own communicator read the story of Minneapolis based „The Bakken“, a A Library and Museum of Electricity in Life here. Find a lot of info about the first release of the movie „E.T. - The Extra-Terrestrial“ in Tim Dirks Filmsite covering the 100 Greatest Films. The 20th anniversary edition re-release is covered in its own website www.et20.com. Read more about the Universal Studios Orlando and the E.T. attraction here. © Joerg Woerner, January 25, 2002. Courtesy of the pictures is Universal Pictures, Cyberspace Creations, Tim Dirks and Mark Cook. Thank you! Their appearances on this site are for informational, non-profit use, and may not be redistributed without expressed written consent.